It is tough trying to find the right words to say when you really care for someone. Some people may be great with words, able to create poems and letters that pull on the heartstrings, but most of us need a little help. That’s where a good quote can come in handy. People who have gone before us have had a lot to say about all matters in life – work, love, family, children, eating, faith and more. There’s no topic under the sun that has not been covered by some of the brightest minds in history. So when you find yourself lacking the right words, don’t fret. 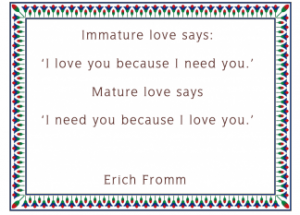 Pull up one of your favorite free printable quotes and sayings on PrintablesFree.com to express those feelings for you. Print the quote, write it in a card or share it via email or on your social networks to show you care. Love is a feeling sought after by everyone. To give and receive love is one of life’s greatest gifts, and one that we take for granted all too often. Have you told your spouse, boyfriend or girlfriend that you love him or her today? Shouldn’t we do that every day, several times a day? The same goes for your children; let them know how much you care about them every single day so there are never any regrets about words left unsaid. If you can’t find the right words to say, use one of the free printable quotes about love available on the site. You can’t go wrong with quotes by some of the smartest, most loving people in history. We have quotes from Mother Teresa, Martin Luther King, Max Muller, Mahatma Gandhi, Orson Wells, C.S. Lewis and Lao Tzu. Each quote brings a special understanding about the nature of love. This printable quote already has a lovely decorative border surrounding the quote, so all you need to do is print it out on quality photo paper or cardstock and put it in a nice from for your wife or husband. You could also print this out and use it as a cover for a scrapbook with your favorite pictures of the two of you together. Give this quote as a wedding gift. Newlyweds are often in need of advice from those who have been married a while. These are timeless words of wisdom that can help a couple grow closer together as they get older.